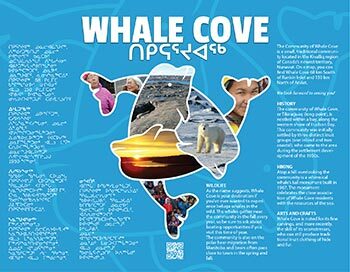 Whale Cove has approximately 415 residents (based on 2012 estimates), 92% of residents are Inuit and 8% are non-Inuit. The overall population of Nunavut is approximately 84% Inuit. Whale Cove consists of a young population. 67% of residents are under the age of 25. Between the years of 2011 and 2018, Whale Cove saw a 16.7% increase in population. The language primarily spoken in Whale Cove is Inuktitut but the majority speak English.